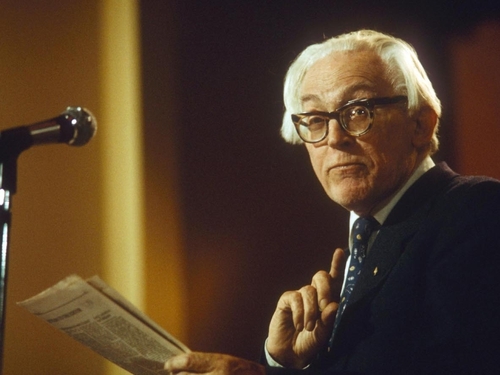 Former British Labour Party leader Michael Foot has died aged 96. Born on 23 July 1913 in Plymouth, Michael was the youngest, and most famous, of a quartet of sons who all became national figures. Lord Caradon was former permanent British representative at the United Nations, the late Sir Dingle Foot was a Liberal MP and later a Labour Minister, and Lord Foot, a former Liberal candidate, sat as a Liberal peer. Mr Foot, hugely popular with the party's grassroots, led Labour in the 1983 election when it suffered a crushing defeat at the hands of Margaret Thatcher's Conservatives. Unfortunately, it was this defeat for which he was most remembered. Many analysts saw him as a politician who was more at home on the backbenches, often uncomfortable as a frontbench man hemmed in by official policy lines which he was compelled to adhere to. By the time he was elected leader, he was already perceived by many as a shambling, white-haired, ill-groomed figure, limping along with a walking stick and a dog at his heels. His very appearance, epitomising, it seemed, the lumbering nature of the old Labour Party, spelled doom at the 1983 general election. Mr Foot was also a journalist of great ability, having edited the London Evening Standard. He was a trenchant biographer and an author of huge merit. Despite the crushing defeat he suffered at the hands of Margaret Thatcher, he is remembered at Westminster with great affection as one of the kindest, most genuine and popular politicians. Unlike most of his Labour contemporaries and in keeping with his principles, he refused the opportunity for a life peerage and a seat in the House of Lords.